We are leading manufacturers, wholesalers and suppliers of Ez-Adjustable plain camera strap supplies and solid color camera straps. The Ez-adjustable plain camera straps can be adjust to (cut to) fit your length easily. Any custom length welcome ! A variety of selection of plain camera strap material, colors or imprinting are available with different style of metal or plastic hardware attachments. We keep large quantity of black, white, royal blue, navy blue, yellow, red, orange, pink, burgundy, light green, dark green, purple, teal and grey color of camera straps in stock. Special Pantone PMS colors with a minimum order of 5000 pieces or more. You can add-on variety of small items by using our camera universal strings. We keep large quantity of black, white, royal blue, navy blue, yellow, red, orange, pink, burgundy, light green, dark green, purple, teal and grey color camera straps in stock. 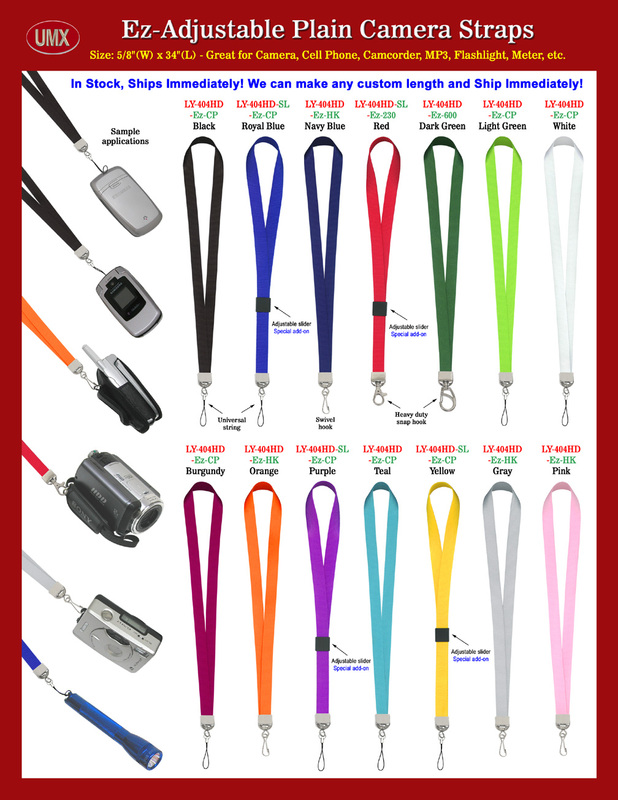 You are viewing Lanyards > Strap Supplies > Ez-Adjustable Plain Camera Strap Supply and Solid Color Camera Strap Manufacturer.